The most brilliant minds should be directed to solving Earth's greatest challenges, such as climate change, says Sir David King. The former UK chief scientist used his presidential address at the BA Science Festival to call for a gear-change among innovative thinkers. He suggested that less time and money be spent on endeavours such as space exploration and particle physics. He said population growth and poverty in Africa also demanded attention. "The challenges of the 21st Century are qualitatively different from anything that we've had to face up to before," he told reporters before the opening of the festival, which is being held this year in Liverpool. "This requires a re-think of priorities in science and technology and a redrawing of our society's inner attitudes towards science and technology." Sir David's remarks are controversial because they are being made just as the UK is about to celebrate its participation in the Large Hadron Collider, the world's biggest physics experiment. 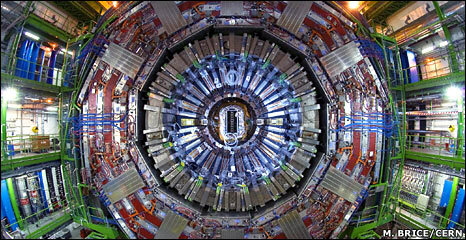 The Collider, built at the Cern laboratory under the Swiss-French border, is starting full operations this Wednesday. It will seek to understand the building blocks of matter, and, in particular, try to find a mechanism that can explain why matter has mass. This international venture is extremely expensive, however. The UK alone has contributed more than £500m to the LHC - the largest sum of money to date invested by a UK government in a single scientific project. Sir David said it was time such funding - and the brains it supports - were pushed to answering more pressing concerns. "It's all very well to demonstrate that we can land a craft on Mars, it's all very well to discover whether or not there is a Higgs boson (a potential mass mechanism); but I would just suggest that we need to pull people towards perhaps the bigger challenges where the outcome for our civilisation is really crucial." Chief among these challenges for Sir David is the issue of climate change. When he was the government's top scientist, he made the famous remark that the threat from climate change was bigger than the threat posed by terrorism. He said alternatives to fossil fuels were desperately needed to power a civilisation that would number some nine billion people by mid-century - nine billion people who would all expect a high standard of living. "We will have to re-gear our thinking because our entire civilisation depends on energy production, and we have been producing that energy very largely through fossil fuels; and we will have to remove our dependence from fossil fuels virtually completely, or we will have to learn how to capture carbon dioxide from fossil fuel usage," he said. Finding and exploiting clean energy sources was now imperative, he said; and Sir David questioned whether the spending on particle physics research in the shape of Cern's Large Hadron Collider was the best route to that goal. He even doubted whether Cern's greatest invention was an outcome that could only have come from an institution that pursued so-called "blue skies research". "People say to me: 'well what about the world wide web? That emerged from Cern'. Brilliant. Tim Berners Lee was the person who invented that. What if Tim Berners Lee had been working in a solar [power] laboratory? Perhaps he would have done it there as well. The spin-out would have come from the brilliant individual." However, John Ellis, a British theoretical physicist at Cern, rejected this analysis. He said the web's invention at Cern was no accident. "The driver for inventing the web was the need for thousands of physicists from around the world who work together on large particle experiments to collaborate effectively by sharing documents and data," he told BBC News. "These were the first communities that needed to go online, leading the way for the rest of humanity." Professor Ellis said everyone recognised that climate change was a critical issue for humanity, and supported the need to deploy resources to combat it. "Space exploration and particle physics are already helping: for example, Earth satellites monitor climate, and particle accelerators offer new technologies for power generation (using the safe and abundant nuclear fuel, thorium) and waste disposal by nuclear transmutation. "In parallel, the distributed Grid computing technology developed to analyse LHC data is already being used for many other applications including climate modelling, and telescopes look for the killer asteroids that could render moot all discussion of climate change." Professor Ellis said one of Cern's most important spin-outs was indeed the brilliant minds that drifted into other areas of science after completing their studies at the European lab.